The east coast rest & play walker jumper solitaire is perfect for strengthening little legs, getting them ready to be walked on. It can be used for jumping or to help baby with their first steps. 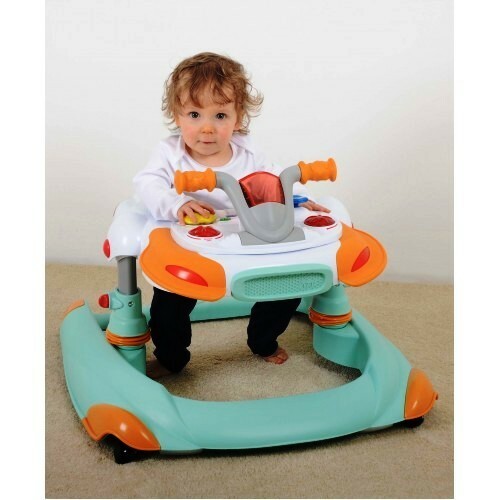 Features: Easy switch from rigid walker to supportive jumper, which allows baby to strengthen their leg muscles. 4 swivel wheels to give baby control over their direction. 8 rubber safety feet, which stop the walker if it reaches a step. Fascinating electronic play dashboard for 6 months +. The tray can be removed for a smooth tray for play or snacks. Adjustable volume control for the musical tunes and sounds. The walker jumper is Intended for children who can sit by themselves (approx 6 months), not intended for children who can walk unaided or weigh more than 12kg.